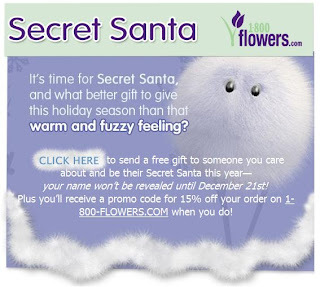 A Simple Kinda Life: Be a Secret Santa with 1800Flowers.com! We all love Secrets and Secret Santas right? I know I do! Let me share with you a Secret Santa program that is doing good for the community! 1800Flowers.com has a Secret Santa application on their Facebook page. To try it out, visit the Secret Santa Application tab found here. The best part is that if this Secret Santa gift is sent 10,000 times then 1800Flowers.com will donate $5,000 to Toys for Tots! So go have fun, be a Secret Santa, and help Toys for Tots! Disclaimer: I am helping Global Influence (formerly Momfluence) spread the word about this important campaign and I may win a prize for doing so. I'm not a secret Santa! What a great idea, very much in the holiday spirit. I love stories like this about big companies helping out charities especially at this time of year.